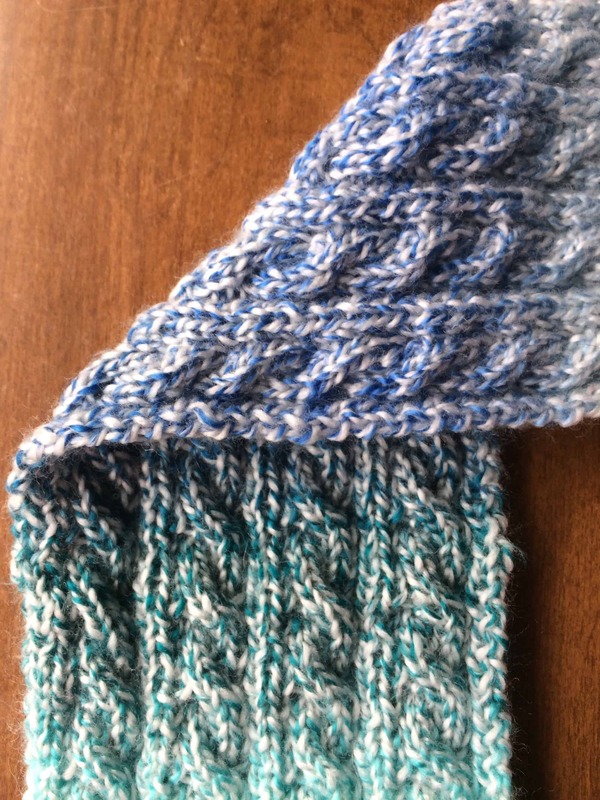 The pattern is pretty easy: K2P2 rib (that’s knit 2 stitches, purl 2 stitches, repeat across the row for my non-knitting family members who read this blog), with the cables worked every 6th row. The pattern is written for 3 cable sections across, with instructions on how many stitches to add if you want additional repeats. At first I cast on enough stitches to do 5 repeats, but it looked enormously wide on the needles, so I ripped out one set of extra stitches. I am happy with that decision. If I had gone with 5 repeats, I would have had to break into the second skein to make the scarf long enough. Since I did not have to use any of the second skein for the scarf, I believe I have enough yarn to make both a hat and mittens to match the scarf. Last year, I made 9 Quinn Bags as Christmas gifts. These purses are full of cables, and by knitting so many, I taught myself how to make cables without using a cable needle. I started the Palindrome scarf doing the same thing. This was a bad idea. I was dropping stitches all over the place. The Quinn Bag cables are only 4-stitch cables; Palindrome is an 8-stitch cable. The stitches for the Quinn bag cables are all knit stitches; the Palindrome alternates between knits and purls. The purls came out pretty tight and were harder to move for the cable. 9 times out of 10, the stitches I dropped were purl stitches. I knit the Quinn Bags with Peace Fleece, a rustic wool yarn that sticks to itself fairly well. 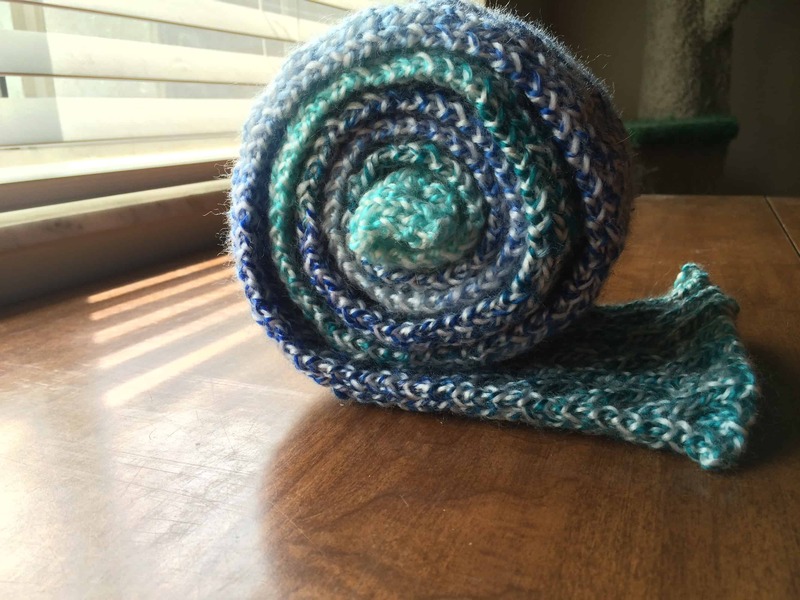 The Pinwheel yarn I used for the Palindrome scarf is 100% acrylic and very slippery. I learned my lesson after one attempt at the cables. On my way to the airport for MDSW, I stopped at a craft store and picked up a cable needle so I could knit this project on the plane, as planned. I bought the Pinwheel yarn from Nomad Yarns in Indiana when I was there visiting my friend a couple weeks ago. This is the first project I have ever made with this yarn. I liked the yarn a lot. The color changes helped keep my interest in the project. Each color change was approximately the length of 4 times through the pattern rows, so I would push myself to knit to the next color change before I stopped for the night. The yarn is a 2-ply yarn, and occasionally splitty. It is also quite slippery. I always use metal needles; with this yarn, I might have liked either wood or plastic to help with the slipperiness! As you might imagine, here in Florida there is a limited need for warm weather gear. As a result, I rarely knit hats, scarves, mittens, etc. When I was in Indiana, I learned that Beyond Homeless, a shelter in Greencastle (the town where The Fiber Event was held) had recently reopened. They had closed 3 years ago, due to a lack of funding. As far as I know, they did not have a stock of warm items. The Palindrome scarf, along with the matching hat and mittens that I should finish by the end of June, will be sent to them.